Big and Beautiful I Article Ellenroad steam mill engine, Newhey, Rochdale. 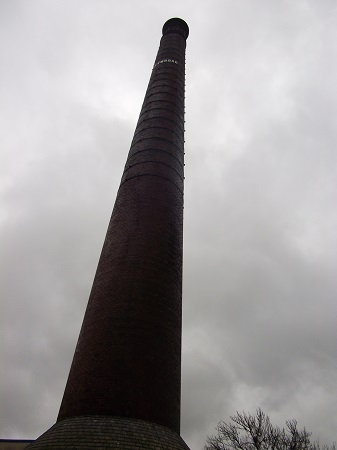 On my many trips oop North as I turn off the M62, about which I could wax endlessly lyrical without pulling your leg even once, I pass a neck- breakingly high chimney pointing upwards to the steely sky over Rochdale. Wrapped up against the winter chill and seemingly constant rain which so soon becomes an endearing feature of these parts, how could I not resist the opportunity to go take a look? What I discovered was that the chimney is a towering sentry guarding the place of something big, beautiful and wonderfully indicative of everything Rochdale is and was. Even if you’re not a steam engine enthusiast, a mule spindle is one of life’s great mysteries, have forgotten who Fred Dibnah was and Gracie Fields is little more than an echo carried on the wind sweeping over Saddleworth Moor, it’s very hard not to succumb to a sense of awe and nostalgia when you come face to face with the remains of Ellenroad Mill and worlds largest working steam mill engine. When it was first built in 1882 at the height of the Victorian Golden Age, the original ‘fireproof’ mill was an imposing red brick building spinning cotton and boasted 99, 756 mule spindles producing the finest grade cotton. In 1916 the mill building burnt down and, rebuilt replacing the slower mules with ring frames, was finally reopened in 1920; a bitter blow for our braves lads coming back from the Great War and only a few short years before the hardships of the great depression. 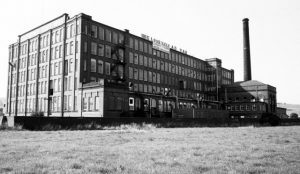 But Lancashire folk are a hardy breed, having survived the upheaval of the move from cotton spinning as a cottage industry and the American civil war resulting in the Lancashire cotton famine 1861-1865, and the mill stayed open for business until as recently as 1982. In 1985 the mill was demolished leaving just the engine house. The debate goes on as to the merits of adopting the ring frames over the traditional spinning mules and their effect as the industry fell into decline. The faster ring frames, requiring fewer, non-skilled labour and producing a coarser cotton fabric, had been developed and used in America 100 years before the ‘stubborn mules’ in the UK finally put them into production. At the time there was no financial incentive to supplying the niche market for fine cotton or preserving the labour intensive skills of the traditional cotton spinner and, much like today, the world spun on the edge of a coin. 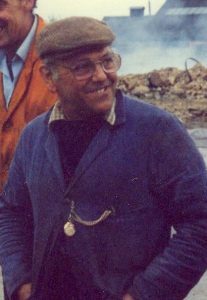 Besides the 220 foot chimney at Ellenroad, still bearing the footprints of the late great Fred Dibnah who spent half his life scampering up such things as a steeplejack and the other half bring them crashing down, the great treasure to be found here is the engine house housing the mighty steam engine. Even for those of us who don’t take enormous pleasure in donning a pair of greasy overalls, the steam engine is a wondrous beast of epic proportions and a reminder of what made Britain Great. The twins Victoria and Alexander, named after the mill owners children and lovingly preserved in impressive green and gold livery produce 3000 horsepower. 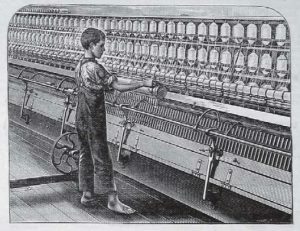 According to James Parkinson’s 1892 treatise ‘How to start a cotton spinning mill’ 1 horsepower was needed to run 100 spindles with a second steam engine, ‘for economies sake’. 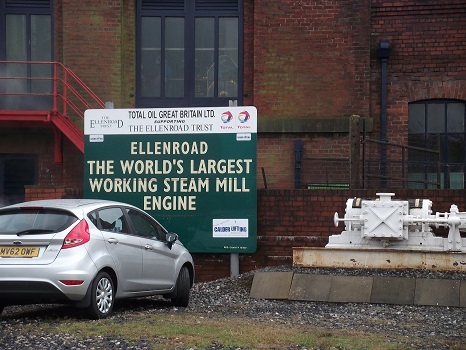 Like so many cotton mills that forged the industrial landscape in these parts, Ellenroad was all about the economies of scale. 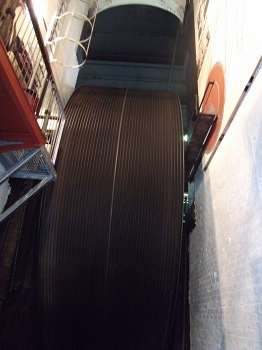 At its height in 1912, the industry produced 8 billion yards of cloth, the immense flywheel at Ellenroad spinning up to 44 separate ropes to drive the spinning machinery in the five storey mill. 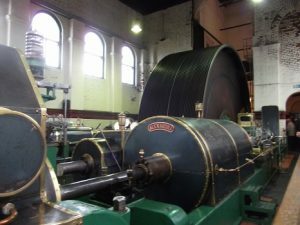 These days, with the clatter of industry gone, just to see the steam engines with their symphony of centrifugal governors and shining pistons effortlessly turning the 80 ton, 28 foot diameter flywheel is an awesome sight. Bending over backwards to take in the sheer scale of the flywheel housing from underneath, the scale diagram of the rope system on the whitewashed wall gives an idea of how truly awesome it must have been when it was working. Below the engine house, Victoria and Alexander are fuelled by the water pumps and one remaining Lancashire boiler diligently fed by the next generation of steam engine enthusiasts under the watchful eye of the current. 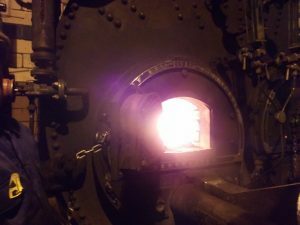 In its heyday, the boiler room housed five boilers used in rotation to allow for cooling and cleaning and consuming up to 3 tons of coal a day. For someone like me, born and raised in the coalfields there was nothing more fascinating and deeply satisfying than getting a glimpse of how my heritage in the East crossed paths with that of the Industrial West. It would have only taken a nod of approval and I would have happily donned a pair of overalls and joined the lads shovelling coal in the hopper.